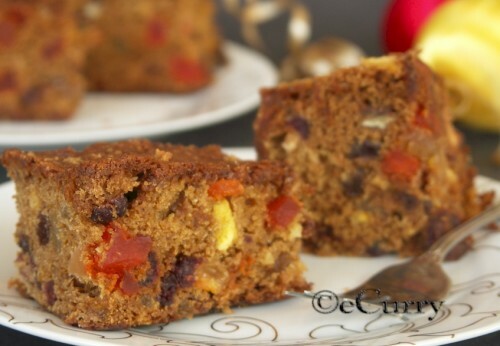 Included in the “25 Gourmet Fruitcake Recipes – The very Best Fruitcakes for the Holidays” by the Examiner! I had been in search of a perfect Rich Fruit cake for many months now. Just the way we used to have back home, during Christmas time – rich, moist, a zillions pieces of fruit at each bite, bursting with different taste & flavor. And every day the taste got better. It was only during this time of the year that those enormous bowls would come out, to make the cake batter. For lots of cakes had to be baked for sharing. The whole family got involved in preparation & each had their own role to play – Chopping, measuring, and taking turns beating up the batter. Then the batter all ready would be transferred to even bigger containers to be taken to the local bakery to have them baked. The tiny oven at home was not enough to bake so many loaves at the same time. The bakery, I remember would be kept open all night, on the 23rd of December, for many would take their cake batter there. Then it was our turn to wait for the cake to come home late at night. Paper wrapped warm cakes would be opened and tasted immediately… and then we would go to sleep. Next day would be busy in preparation of giving out the cakes. My search has ended. I have seen so many Fruit Cake posted with in the last few weeks, & all had been my inspiration. Finally I picked a recipe which sounded very familiar with what I saw being made at home. The recipe has been been adjusted from Sailus Kitchen & Here. Chop all the Fruits & Nuts & whatever you have decided to use, into small pieces and soak them in rum & wine mix in a large jar. Mix in all the dry powders (nutmeg & clove), give it a big shake & let the fruits macerate for atleast a week. The longer they soak…even for a couple of months, the better. Make sure the there is enough space in the jar for the fruits will almost double in size. ( I used 2 large jars & half filled them each). Every few days shake up the jar. Heat a heavy bottomed pan and cook the sugar and a tbsp of water on low high heat. The sugar will melt and start to change color to brown. Swirl the pan around, once or twice. When you find that the color has changed to a little darker golden brown color, turn off heat. ( If you want dark caramel, let the sugar turn darker shade of brown, otherwise switch off the heat when the sugar starts to just brown lightly). Immediately, pour half a cup of water very carefully into the caramel and stir to mix well. Sieve the flour & baking powder & keep aside. Separate egg yolks from the whites. Whisk the egg yolks separately with vanilla. 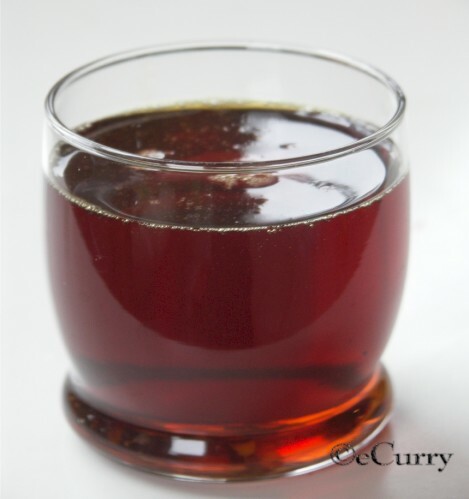 Combine the powdered spices and caramel, & combine this to the above mixture till blended. Add the sieved flour & baking powder to this in few batches and combine till blended. 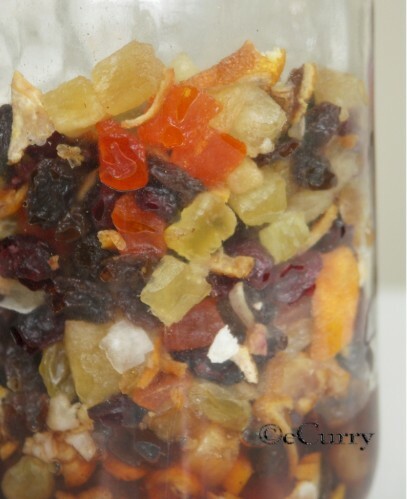 Strain the soaked fruits & nuts. Save the rum & the wine. Add the dried fruits (toss the dried fruits in couple of tablespoons of flour) and fold it gently into the batter with a spatula or wooden spoon. Whisk egg whites till it forms peaks and gently fold into the cake batter till well combined. Grease the cake pans and line with parchment papers. This cake will need 2-3 layers of paper to prevent it from getting dark. I actually greased Newspapers & used them to line the cake pans. Pour batter up to half of the prepared cake pans and bake in a pre-heated oven at 325 degrees F for about 45 minutes. Check once at 45 minutes & do a toothpick test. You might have to bake beyond an hour. So bake at 200 degrees F after 45 minutes, till the cake is light brown and when the toothpick or a skewer comes out clean. Cool on a wire rack. When cooled to touch, remove the cake from the pan and peel the paper. Make few holes on the cake and drizzle the top with the saved rum & wine. You can do this several times & use more rum if you want it really rum soaked. Cool the cake completely before wrapping it. The cake matures best after atleast a day. So keep away the cake for a minimum of a day before serving for the flavors to best infuse. The cake was as good as it could be. 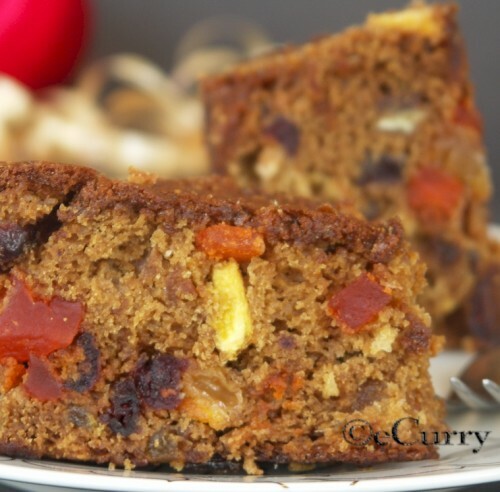 It was moist, as if totally rum drunk :-)… the fruits & nuts inside looked & tasted gorgeous. Everything was just right. After many years I baked a fruit cake on the exact day that we did long time back, a cake I longed for, every bite filled with memory, joy & festivity. Sending the cake to Santa’s Holiday Challenge hosted by Tasty Treats. i am always game for the rich fruit cake, opposed to the creamy ones! 🙂 real nice. YUM! I am a huge fan of plum cakes and fruit cakes And the fruits soaked in rum and wine? amazing! THey look moist and delicious. Great job as usual. Yes Fruits soaked in Rum & Wine :-). Thanks! Me too, I also love the plum cakes which we get in bakeries in India. I’m sure your’s tasted just like that. Mine tasted good too but it was a different good. I think you can use aluminum foil for lining the pans instead of newspaper. I will try aluminium foil next time. i remember seeing when I was small that newspaper was used… so i thought it provides better insulation. what a lovely cake recipe and the pictures look so yummy! wishign you a merry Christmas too! Thanks ! & same to you PG. Yes so many similar memories:-) I did write about soaking the cake with Rum, Sharmila… It does taste better that way. Same to you! wow..looks delicious…I just love the way you describe elaborately all your recipies…and lovely photos Soma !! Merry Christmas to you n your family. Thank you so much for your appreciation! Same to u & your family! Wow! I would love to do that:-) We are eating a lot too. Thanks! Fantastic fruit cake Soma and it does look so festive. Love ur decoration and ur cake is awesome. Merry christmas to you all, Soma. I am awed by all the pictures and the beautiful decorations. I loved rich fruit cake,but never ventured making it. Thanks Supriya! Merry Christmas to you too! Merry Christmas to you too !Thanks. drool drool drool the cake looks delicious! merry christmas to you all! Very nice Cake ….Merry Christmas to Soma and family….What is the alternate of Rum? Going to use orange juice…..Sorry did not notice it before………..
Fatema, I have added some more details in the post. Merry Xmas! Lovely fruit cake …. Merry Chrismas to you too! mouth-watering fruit cake. Yum! Happy holidays. Happy Holidays to you too! Thanks! wow this fruit cake looks really yummy. wish i had it now.. i did have some rum choco cake today in the morning and i liked it a lot.. pics are great! Hey i had it once in Goa, and since i wasn’t previously exposed to such cakes i was afraid that after eating it i will feel dizzy (under alcohol influence)so i was like nibbling on it, and it was bit bitter too.Don’t know whether it always like that or that particular cake was bitter.But this one looks so tempting ,i m wondering whether i can try this again?? And i was actually EYING on that caramel ,it looks so perfect..wonderful ! Alka… Unless u soak the cake with rum after it is baked, the alcohol used for soaking and added before baking actually evaporates, so it does not get you drunk.. LOL . It should not taste bitter, unless the caramel was overdone, or the fruit peels were big & chunky.. which can be bitter. your fruit cake looks really yummy…..beautiful photos….Happy holidays to you too Soma!!! Thanks Swapna! Happy Holidays to you too! This does look the perfect cake for this time of year. Have a great Christmas! I love your cake and I wish people would not look at me in a wierd way when I say I actually like fruit cake! Anu, i am aware of the “weird” look … 🙂 But i really do not care … I will say again & again that I love fruit cake & cannot have enough of it:-) Happy Holidays to you! Soma…If I am using the orange juice, do I need to keep the fruit in the refrigerator ? Soft n moist cake. Looks lovely. Wish you a happy new year! May all your dreams come true. What a rich and delicious cake, Soma! Just got back home from a short vacation – the sight only makes me want more! Nice looking fruit cake! I like the caramel in it. Happy Holidays! been wanting to make this for years! thanks for posting this! I didn’t use any paper or foil in my pans and it came out just fine. I also forgot to buy oranges to puree so I just used 2 cups of orange juice – came out just fine. Thanks for letting me know 🙂 It does work without the papers! I got frantic since it was my first time and I wanted to stick to the old ways. I used your recipe to make caramel for my fruit cake and it came out perfectly in just the first attempt. Thank you for sharing. Merry Christmas! Thank you so much for this post. I made for this years christmas , to be precise just today .. and the cake has come out so well.. my husband loves it… thanks a ton for such a wonderful detailed recipe.. happy holidays and wish you a very happy new year ..
Quick question is the temperature mentioned here (325) in centrigrades or Farenheit? I tried making this cake yesterday at 325 Farenheit and even after baking for 3 hours it turned out un cooked. It is 325 Fahrenheit. I mentioned in the post that after 45 minutes if you need to bake, reduce the temperature and bake longer till the inside gets cooked. (you need to reduce the temperature so the outside does not burn and turn dark, but to cook the inside). But 3 hours seems a bit long, unless the batter got too runny. Did you bake it in a regular oven or toaster oven? I would assume the regular oven…. just wondering what could have happened..
Could you complete baking it beyond 3 hours? 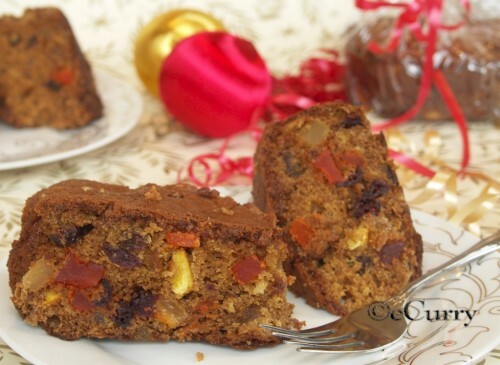 I really love to eat rum fruitcake! yummy it is! I’m a 60 year old married male. Do not cook daily. But as a kid I helped my mother bake her fruit cakes every year. Found a recipe for “Rum Fruit Rings” from Esquire magazine once. It was better than mother’s. Unfortunately, that recipe got lost. Soaking the fruit a week in rum and wine removes most of the flavor from the fruit and turns most everything red looking. When the fruits were strained, there was a lot of rum/wine syrup that drained out. More than enough to pour over the cooled cakes. BIG mistake soaking the NUTS!!! Soggy nuts lose their crunch and flavor. Toast nuts slightly before chopping and adding to the batter. The nuts will soften some as they bake. With heavily lined pans, I had to bake an additional hour at 200 degrees to get a skewer to come out cleanly. 2 Medium Oranges Pureed (With Skin) is a strange “base” for a cake. The ground up orange peel adds an overwhelming “tang” to the cakes. Makes the cake almost too tart, masks other flavors and makes it almost inedible early on. Needs time to mellow out and incorporate with the other flavors. I baked my cakes each in two lined loaf pans (=4 loafs total.) I cut one and left the rest wrapped in heavy aluminum foil to age. I turned the cakes twice a week. Opened them weekly to add additional rum/wine when they appeared too dry. Cakes aged 15 days were delightful. Carried one cake to each of 3 parties. Explained they were RUM cakes made only with dried fruits. That they were similar to dense-textured English plum puddings which are steamed instead of baked. Thanks for this recipe. The perfect jumping off point for my fruit cake recipe! Thank you very much for taking your time and writing up a feedback. I really appreciate. As you said, this cake seems very British. It is true. In India during the Christmas time, it is very traditional to bake this cake (probably remnants of the British raj). 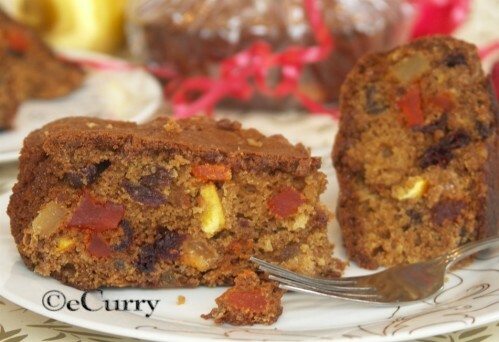 It is also available in the bakeries and is usually known as Plum Cake or Fruit Cake rather than a Rum Cake:-). However the most important part of this cake making process is soaking the dry fruits in rum, which is done sometimes even a couple of months before baking the cake!! I do agree with you about the nuts getting soft. What I do now, (and I should have updated the post), is use nuts to soak and also add extra chopped nuts for the crunch. The flavors that the fruits develop soaking in the rum is unbeatable. The oranges are vital with the peels. It is true that flavor develops with time and that is the way the cake is meant to be. It sits for weeks with the rum getting dripped in it. The peels serve another purpose and this is my personal derivation: it balances the sweet of the cake with its bitter. Personally I love the citrus flavor, and the amount of course can be adjusted to taste. I do try out different versions of the cake at different times – without the caramel, without soaking, etc.. but still I like this the best, since this is the closest to the one I grew up eating. I am really glad, the cake was a hit!! I would love to try out the cake that you used to do and lost the recipe! Again thank you for trying out and for your feedback. 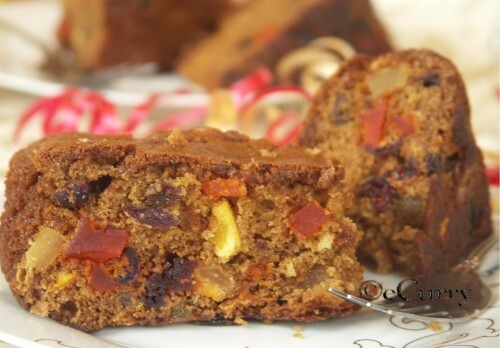 Really fruit cakes is so yummy,and always take in my celebrations and parties, Here you post a great tips to make fruit cakes. This is a wonderful recipe that I would like to try. I just have a couple of questions, if you can answer that, I would be more than grateful . 2. When you finish baking, you soak it with Rum. Can I skip this as I am not going to be using rum? 3.Do I have to use all the spices that you have mentioned? My sister cannot stand ginger! Yes I had stored the soaked fruits and nuts in the refrigerator. If you soak it in rum, it might not be required, but I did not take a chance. yes you can skip the slow soaking with rum. I did this since this is the traditional way to do it. But you can def. adapt! the rum flavor is very much required in a fruit cake (unless you do not like it).. you can buy the artificial Rum Flavor available in the baking isles, if you want the flavor but not the rum. Skip the ginger 🙂 use any spice and in any combination you want!!! What size cake pans? 8″? 9″? Springform? How many pans? Will loaf pans work? Will I need to bake longer? I know it’s too late to try this Christmas, but next Chrismas for sure! You may bake this in any kind of pan you want. I usually do a 12 cup bundt pan or 3 loaf pans depending on the size you use. Could the fruits also be pureed instead of chopped, like it is done in the West Indian fruit cakes? If you puree the fruits, the consistency of the batter will change to a certain extent and you will have to adjust the amount of other ingredients. Hi soma, this is a wonderfull recepie I tried it and come out very well, today I am going to make it again as a christmas special..Thanks a lot for this yummy cake recepie…. I appreciate your feedback and it makes me happy that you liked it. sorry it took me so long to reply. I haven’t been online almost all day. Sometimes the oven and also the liquid content in ingredients may make a difference in the cooking/baking time. I think its too late, but its a good idea to cover the top of the cake with a foil if it takes too long so the top does not brown or burn. I just want to thank you for this grt recipe. I tried and it was a hit. every one liked it. thanks a lot. Thank you so much for trying and your feedback! I just tried this recipe out for chtistmas and it was awesome! Cake was moist, tasted sinful and my guests loved it! I highly recommend this recipe! Really appreciate your feedback. So glad that you liked it! 😀 Glad to know that you enjoyed! I had searched your archives and found this recipe in 2010, but finally baked it for xmas in 2011. 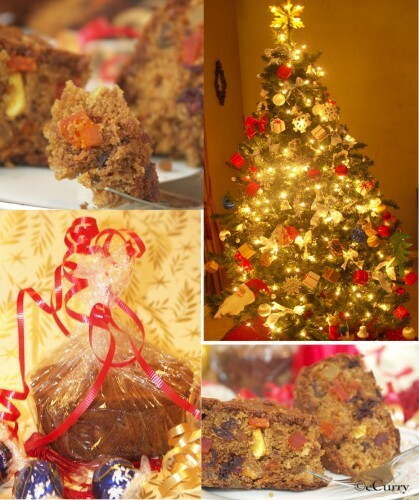 It was the best fruitcake recipe I have tried so far. Many more steps in this one compared to my old simplistic fruit cake. But so worth it at the end. I ended up baking it in a 10″ springform pan and it looked marvelous with the rum glaze on top. The old Kolkata fruitcake eaters, on whose requests I usually bother making fruitcakes at all, declared it very close to the original they used to enjoy years ago. Thanks! 🙂 Thank you so much! Yes the memories of Kolkata fruit cake drives me to this every single year, and even now only few places in Kolkata have still maintained their standards. Makes me happy that you found it similar and it satisfied you!!! What size cake pans? Does this cake need to be refrigerated? I’m already starting to think/plan for Christmas. Now I feel silly, remembering you previously answered my pan size question earlier. The photos look as if regular, round cake pans were used. Seems like baking time would would vary greatly; bundt vs loaf vs round. A 10″ round cake pan would work. 😀 hope it helps. nice cake. now i can make it at home. its not a easy task if measurement goes wrong it will not be perfect. thanks for describing it well. Thank you for trying out the recipe and I hope everything turned out well!! and hope you enjoy:) Happy Holidays! I am planning on making smaller cakes and what I have are the 10 ounce glass Anchor Hocking baking bowls. What would you recommend for temperature and time in baking with these? To tell you the truth, I am not sure at all! Even with this recipe, I have had people use different times (those who tried it). Sorry I cannot help. Try to keep the same temperature as mentioned, but you might have to manipulate the time… try and see if the cake is done and bake more or less based on that. If it needs to be baked longer, cover the top with a foil (Lightly) so it does not brown too much. Other than the baking dish the baking time depends on a lot of other factors. I have learned that for this particular cake, from the comments and the emails I have received from those who tried it out. This recipe looks fantastic! At present my dry fruits are marinating in rum. Is old monk ok? I did not use red wine because it might stain all the fruits red. I’ll make this in the next 4 days. Will post a review. I’m pretty sure it’s going to be fantastic. The fruits smell lovely. Thank you so much for giving it a try! 3 KG’s prepared, 2 more KG’s on the move. Tried it today with the exact measure & ingredients, but it was more of a pudding than a cake. as the end result was disappointing and not even close to the pictures you have shown. I am sorry you are disappointed and the cake did not turn out right. Sounds like it was not baked long enough. The baking time might need to be adjusted as the oven kind/temp will vary from one home to another. There is nothing wrong with the measure of the butter. I have baked this cake many times and so did a good amount of readers (see all the comments of those who tried it out successfully with the exact ingredients). The photographs are from the cake I had baked with the measurements I have written down. I never post anything but what I make, and only after I am sure of a recipe. Hey, Thanks for the yummy recipe. I tried it yesterday and the result is great. Wish you a merry christmas! Thanks for the lovely recipe. I just finished baking the cake and it does look lovely. Hope it tastes good too. However, I have a few questions. Do you use butter at room temperature or melt it down before you blend it with orange paste? I used the butter at room temperature and it curdled when I began to whisk it with the orange. But thankfully the batter turned out smooth after I added the flour. Also, I soaked the fruits and nuts in the quantity of rum you have mentioned but somehow they soaked in all the rum and I have no rum left to drizzle on :). Will have to buy some more. Hope you had a great Christmas and Happy new year! the theme/design), I don’t have time to read it all at the minute but I have saved it and also included your RSS feeds, so when I have time I will be back to read more, Please do keep up the fantastic work. WHAT SIZE BAKING DISHES DO I USE FOR THE RICH RUM FRUIT CAKE RECIPE? AND HOW MANY DISHES? I HAVE 9X5 GLASS LOAF DISHES AND BUNDT PANS AS WELL. I usually bake it in a 10 inch round pan (have updated the post). Loaf pans and bundt pan would work too. Thanks for the recipe! I tried it today and am eagerly awaiting the results tomorrow since it needs to sit for a day (or more). I made one without drizzling the leftover rum/wine because 1) ran out and 2) needed something for my non-alcohol loving family to try. Interested to see how it tastes without being rum-soaked. I tried three attempts to make the caramel – the third time was a charm but only because I 1) double the amount of water to use while cooking and 2) turned up the heat to what you probably would think would scorch it. I’m curious as to whether anyone else had this same experience? On the first two attempts the sugar, while cooking, soaked up all the water and started to dry out…and crystallize. Very odd. I’ve never had this happen before. On the third attempt I doubled the water while cooking and turned up the heat significantly (to high) and it worked perfectly. I tried this in 2011 and failed because I didn’t realize what “whisk egg whites till it forms peaks” really meant. I made scrambled egg-whites and tossed them in the mixer with the batter. Wife laughed after the fact. The single cake was super dense, very moist in the center, but tasted good. Didn’t given any away. Tried again in 2012 (Xmas eve in fact). Fruits/nuts marinated for 4 to 5 weeks in advance. I baked in small pans (tiny loaf pans and easy-bake-oven / cupcake sized tins). No parchment paper. Each cake was 1.5″ to 3″ tall. They rose better, but still came out pretty dense and the larger ones were dark and moist in the center. The others were better. Air drying helped keep the tops less tacky. We wrapped some and gave them away. I have never made this eggless or in MC convection. To replace eggs you can use 1/2 tablespoon of flaxseed (soaked in water) for each egg and then add a few tablespoon of applesauce to make it moist.I cannot say the time or temp of the baking in the convection. I am sorry! Can this Rum fruit Cake be ‘stored’ and if so under what conditions (Refrigeration) and for what length of time and how ‘packages’??? Yes it can be. Wrap with cling wrap once cooled. I have stored it upto a month. how to make orange puree which u mentioned in the cake. Peel seed the oranges. Blend them to a puree. Raw oranges need to be blended aur I need to cook them up…. Byt really I tried ur recipe n cake came out really really well… My hubby friends n family jus loved d taste …. Thanks a ton …. Thanks, I’ve recently been looking for info about this topic for ages and yours is the best I’ve discovered so far. But, what in regards to the conclusion? Are you positive about the supply? and energy to create than koi kalle mattson waterfalls video. we treat our living spaces. All roads should now be leading to the Yosemite National Park in California’s Mariposa County. Estuve apunto de trabajar alli, y en mi epoca no eran nada malos, ahora, en otros centros donde yo trabaje, cuando se da un terminal por irreparable pr ohumedad (mojado) se suele hacer un escaneado de la zona y se adjunta al pack en devolucion para que el cliente lo vea. No digo que sea tu caso, lo expongo para la gente, en el sat no son tontos, y te digo yo que SE VE MUY BIEN si esta mojado no. En todo caso, cuando me gasto un dinerillo en un aparato, no quiero tener problemas con él a las dos semanas. And think me, too many clinicians are just as confused as you have to do with the information of genital herpes. web site, it contains precious Information. There you remain in college, and you get to go back to high school again to find a sweetheart. C) to 100 °F (38 °C), even during late autumn and winter months. forex signal support you then will be needing a website to attract consumers. After the cakes are done you poke the cakes and drizzle rum on it and how do you store it? Wrap it in aluminum foil or cling wrap or in a bigger box? Yes I poke and drizzle rum. Once cooled, wrapped in foil or cling wrap. I usually wrap and box it. Hi,Soma,the recipe seems perfect but my doubt is can we add canned orange juice instead of fresh oranges as sometimes they are not available.Can this juice be added along with Rum to the chopped fruits. I dont see why not! I’m into photography and would like to start selling my work and attracting more clients. My question is how would I go about starting a website where people can buy my photos or contact me about taking photos? I’m looking for a way to maximize my advertising and would really like to start a website. Any advice would be greatly appreciated..